Price: £3.20 (incl VAT) Sorry, this product is no longer available. Numark Beclometasone Hayfever Relief Nasal Spray - Beclometasone Dipropionate. This nasal spray provides effective relief from hayfever. 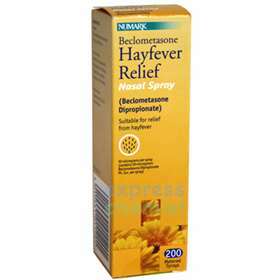 Numark Beclometasone Hayfever Relief Nasal Spray contains a steroid which reduces inflammation in the nose. The inflammation is responsible for the symptoms of hayfever such as sneezing, itchy and blocked up or runny nose. Directions for Use: Squirt 2 sprays into each nostril twice a day. To get the best results from the nasal spray use it regularly. When you start to feel better reduce the dose to one spray twice a day. Do not give to adults under the age of 18. Ingredients: BECLOMETASONE DIPROPIONATE, DEXTROSE, POLYSORBATE, MICROCRYSTALLINE CELLULOSE, SODIUM CARBOXYMETHYL CELLULOSE, BENZALKONIUM CHLORIDE, PHENYLETHANOL AND PURIFIED WATER. Warnings: DO NOT USE IF YOU ARE PREGNANT OR BREAST-FEEDING. DO NOT USE IF YOU SUFFER FROM A NOSE INFECTION OR PROBLEMS WITH YOUR SINUSES. DO NOT USE IF YOU ARE ON OR HAVE RECENTLY TAKEN STEROIDS. Product code: 1098417 Price: £3.20 (incl VAT) Sorry, this product is no longer available.